1. Mario Badescu Alpha Grapefruit Cleansing Lotion (c/o) - Toners are probably my single favorite skincare item, and I am quickly on my way to amassing more than any human should own. This particular one helps with refreshing my skin, with giving a slight exfoliation. A perfect marriage after cleansing. 2. Liz Earle Cleanse and Polish - My apologies to all my readers for not mentioning this holy grail product sooner. This cleanser is to be used with a muslin cloth, and gives an amazingly thorough cleaning, while still being incredibly delicate and soft on my winter-beaten skin. Only sold in the UK, I order mine through her website, and while it takes some time to arrive, it is worth the thousands of miles traveled. 3. Tatcha Deep Rice Enzyme Powder (c/o)- Yup - this one again. The finely milled powder makes this exfoliator ideal for winter when you still need to have those dead skin cells off your face, but need it done gently and smoothly. Read my full review here. 4. Arcona Raspberry Resurfacing Peel - I'm new to the Arcona range - this was my first foray into the line, and I couldn't be happier. This peel tingles slightly when applied, but the results are bright, glowing skin that feels hydrated and renewed. Take THAT winter! 5. Kiehl's Ultra Facial Cream - Even though I am oily as the day is long, my skin is still in need of some serious hydration in the winter - and this cream has been a staple for years. Super effective, 24 hour hydration, easy to wear, non-greasy, great for all skin types, good for day or night.....need I go on? Get it. 6. Korres Advanced Brightening Sleeping Facial - Recently named in my favorites, this cream is the perfect winter night cream. Rich, luxurious, and leaves my skin radiant in the morning. It's dreamy, trust me. 7. Lush Popcorn Lip Scrub - My lips are absolutely unacceptable in the winter. They are dry, cracked, and all around unappealing. I tried to get by with wearing bright lipstick to detract from their horrid state, but it only seemed to make it worse. Enter this yummy scrub - I use it night and day to exfoliate on and around my lips. And the bonus? It tastes like sweet buttered popcorn and you lick off the excess (trust me, it is better than it sounds). A beauty dessert. I'm in. 8. Kiehl's Lip Balm - Now once the scrub is all licked off (again, it is better than it sounds), I apply this rich, emollient lip balm and my lips are instantly post-winter lips. Note to readers: this balm comes in approximately a million different flavors and I LOVE THEM ALL. This one is cranberry - and it's delightful. 9. Koh Gen Do Cleansing Spa Cloths (c/o) - If you have not yet discovered the amazingness that is the Koh Gen Do Cleansing Spa Water range - I will need you to stop what you are doing (ok finish reading my blog first), go online or march to your local Sephora and pick up immediately. Seriously - holy. grail. worthy. These wipes are incredibly gentle, amazing at removing makeup (and cleansing my skin when my whole nightly cleansing ritual is not happening) and help to soothe my skin if I am experiencing any irritation. Basically - they are happiness in a makeup wipe. 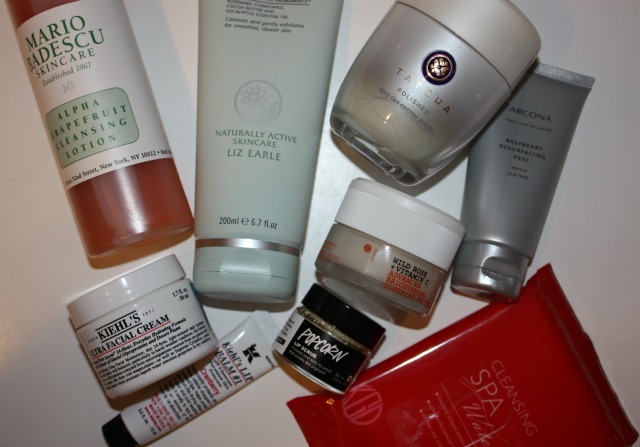 What are you favorite winter skincare staples? Anything I am missing?